When New York’s street signs read “No Parking”, they’re not kidding. 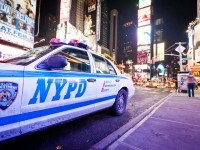 Like renewing your car insurance, you should pay attention to where you park in New York City – even if you’re the FBI. For decades, the FBI’s vehicles were safe from New York City tow trucks, however, over the past few years, the FBI, as well as other agencies, have been on the receiving end of the law, and had their illegally parked vehicles towed. And, to add insult to injury, not even police vehicles are immune. The group behind this is a towing unit from the police department’s Internal Affairs Bureau, responsible with enforcing specific parking violations committed by official government vehicles. It makes no difference if the car is a black sedan covered with antennas all over the trunk, or displays an official government sign on the dashboard. If the vehicle is parked in a no-standing zone in Manhattan, it’s off to the impound yard — no exceptions. In most cases, no fines are paid, but the vehicles’ drivers must first visit Police Headquarters in Lower Manhattan and provide documentation that the vehicle was on official department business at the time of the towing. • other areas that parking was forbidden. The Police Department’s hardline, no exceptions policy began in 2008, when an Internal Affairs Bureau sergeant was ordered to ride along with tow-truck operators as part of Mayor Michael Bloomberg’s promise to halt illegal parking by city employees. The goal was to put the brakes on fake placards and nab off-duty city employees using their placards for personal use. But the units also towed detectives’ unmarked squad cars that were illegally parked, even if the detectives were working on official department business. In the past, if traffic agents discovered illegally parked federal vehicles, instead of towing the vehicles, they would usually just write up a summons. The ticket would be paid either by the agent or by the government, depending on the circumstances. In New York, special agents are usually assigned a car from the federal government, for round-the-clock access. Through an established agreement, the Police Department issues parking placards to each agent – they come with only limited parking privileges, and can’t be used to park in no-stopping or no-standing zones, at bus stops or in crosswalks. In addition, they can’t be used in the garment district during specified hours, among other limitations. It is uncertain if the towing enforcement will remain in effect per the new police commissioner, William J. Bratton. What is certain, though, is if you’re caught in the State of New York driving a car without proper car insurance coverage, you automatically will lose your driver’s license. Make sure your insurance is up to date. Have you had your car towed for illegal parking in New York? Feel free to share your thoughts in the comments section below.